Tru Trac Serpentine SystemBig block Ford 429/460 fans the wait is over, the finest serpentine system available is right here. 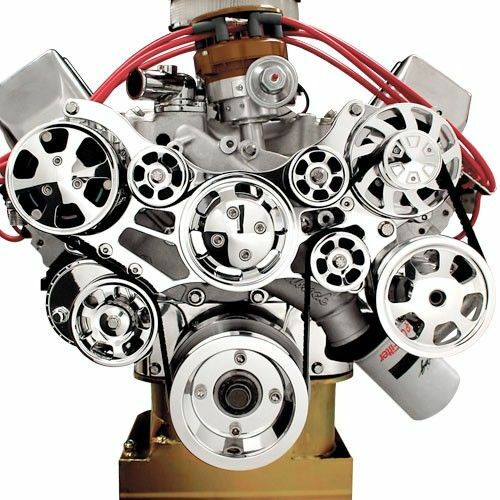 Based off the successful and proven small block design, Billet Specialties big block Ford Tru Trac serpentine system answers the need for performance and style in one compact package. True innovation is the key here, from our patent-pending billet aluminum timing cover and our exclusive billet tensioner specifically engineered for the system right down to the stainless hardware. No other components or add-ons to buy, it's all right here ready for you to bolt on to the front of your Ford. Once again, Billet Specialties leads the way. Kundenbewertungen für "64-73 Ford Mustang (429) Umrüstset auf Flachriemen - 429/460 Motor"